Welcome to the second year of Palliative Care Grand Rounds, the monthly review of the best of hospice and palliative care content from blogs. When I first thought of adapting the popular Grand Rounds concept to our field, I was not sure if Pallimed would be hosting every other month. I had some doubts about the longevity of the idea, but I really wanted to be able to feature all the great writing that may lie undiscovered. There are over 40 active hospice and palliative care related blogs in addition to all of the other blogs who may not focus on this specific area but may occasionally write significant posts which would resonate with our readers. Well one year later Palliative Care Grand Rounds is still here and we had 11 different blogs participating last year (we started in February). So I would call that a success. I am currently taking offers for anyone who would like to host an upcoming PC Grand Rounds. (email: ctsinclair@gmail.com). Hospice Physician blogs about the failure he encountered when a cardioloigst told him: “when I see you, I think that someone (a physician) has failed.” We can all collectively shake our heads now. DoctorRW posted about a recent CMAJ article correlating the spike in deaths from opioids with the increase in prescribing of long acting forms of opioids. This article has been on my 'to blog' pile yet has never gotten screen time. DoctorRW makes points about the culture shift towards more aggressive pain control by physicians as a result of marketing (illegal and legal), regulation (via JCAHO and other orgs), and a changing public expectation. This is also a time of rapid growth in the palliative care field, which he did not mention in his article and I wonder what role does hospice and palliative care play in this highly complex system. Daily we strive to break down barriers to appropriate opioid use, but is there collateral damage to the community from increased access. How do we handle controlled substances after a patient has died? I wish we talked about these things more often. Maybe I will this year on Pallimed! Bob Arnold blogs at GeriPal about 'the downside of the growth in Palliative Care'. Are we deskilling other doctors who are more than willing to turnover a tough conversation to the palliative care team? Read the comments to see a great discussion. Judy Chamberlin from Life as a Hospice Patient blogs about the frustration of a very important minority group that never seems to have a voice: hospice patients. I agree most articles about hospice typically quote the staff or family members of current or already deceased hospice patients. The challenges in getting a larger pulpit for a person on hospice services are many, but luckily Judy may be starting a trend. Judy does a great job sharing the impact of 'What good nursing can do' in another post. When is a cure not really a cure? CancerDoc has a very poignant example. "So, why can't I walk?" "Well, it's not as simple as that." "The cancer was in my back, right? You said it was in my back? Now, it's not. Now, it's CURED..."
Alex Schadenberg from the Euthanasia Prevention Coalition blogged about the rise in deaths from euthanasia and physician assisted suicide in the Netherlands. He questions the lack of information about babies who die under the Gruningen protocol or the prevalence of disabilities or dementia in those who die from euthanasia or physician-assisted suicide. Obviously you can tell by the name of his group where he stands, but I think these questions are important regardless of where you stand on this issue and as a matter of public policy in balancing the protection of some with the freedoms of others. Maurice Bernstein at Bioethics Discussion Blog asks the VERY tough ethical question about whether we are treating the patient or treating the family? Read and add to the comments, because I am sure if you are reading this blog you have had some encounters with this situation. StorytellERdoc tells of his palliative care experience in the ER. Do you know any ER physicians like this in your community and are you supporting them? LeighSW from Confessions of a Young (Looking) Social Worker blogs about the new book Super Freakonomics and makes a connection to the offering of more chemo options via the chapter "When should suicide bombers buy life insurance?" The book is from two economists who look at human behavior and decisions via economic models. Not just financial but basically taking all the different issues and giving them values so they can compare choices and ultimately the decision made. I was very pleased to see someone else loves Freakonomics (by Levitt and Dubner) as much as I do, although there are some poorly quoted facts about the potential to 'time' your death around a holiday, which is also on my 'to blog' list. Tim Cousounis at Palliative Care Success comes up with some great new terms. One I particularly like is Accountable Palliative Care Organizations. I have hear him use the term Advanced in place of Accountable and I think either term fits well. See how he describes an APCO. Will the rise of APCO's push out smaller hospices? Booster Shots the (LA Tmes Health Blog) gave a warm reception to the recent arrival of a free guidebook on what to do when you are diagnosed with a serious illness. Courtesy of NHPCO and the American Bar Association. This is an excellent resource! Click over to Jerry's blog to read the excerpt from Joyce. Jay from Two Women Blogging also speaks about a recent funeral of a colleague who suddenly died She reflects on her own responses to the loss and how her work as a hospice physician informs her feelings. If I were to assess my risk of complicated bereavement, as we assess the friends and families of our patients, I would say I am routine, not high-risk. I have good social supports, a strong faith, a healthy sense of self, and plans for the future. But today I am reminded of how much routine hurts. 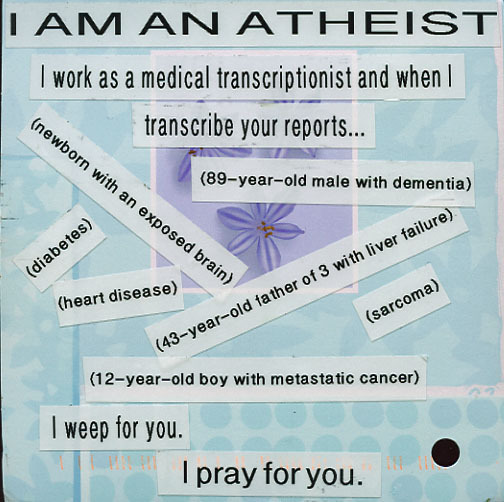 I have always wondered what medical transcriptionists for hospice and palliative medicine doctors think. 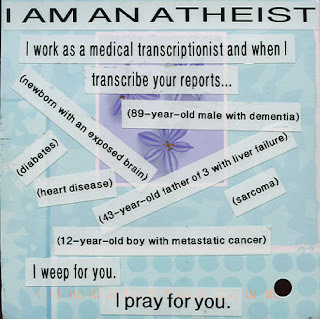 Here is at least one thought from the excellent website PostSecret. A blog post on Improbable Research led us to this story in Science Daily covering the connection between smell and....ethics?? Apparently rooms spritzed with Windex makes people more fair and charitable. Good little way to start your next ethics committee meeting. Or health care reform debate. GeriPal blogger and co-founder Eric Widera covers the best of the BMJ Christmas Issue, which is always filled with funny or quirky research articles. 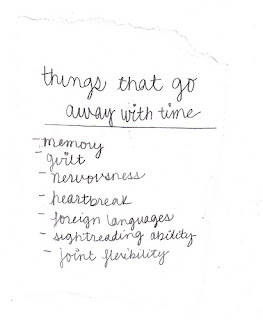 My favorite is "Lying Obliquely - A clinical sign of cognitive impairment." Is the Grinch just depressed? Dr. Shock fills us in. Thanks for reading. Click through to the blogs, and let them know you found them here and give some comment love!